This is somewhat minor, but I do not think this was discussed yet. Although this require some PCB redesign, I think it would be nice to see in the future. When the torque is applied while attaching wires to the terminal, they move around, which could be prevented if they were installed a little deeper into the PCB. This concerns the main power connector, bead heater, and extruder heaters. 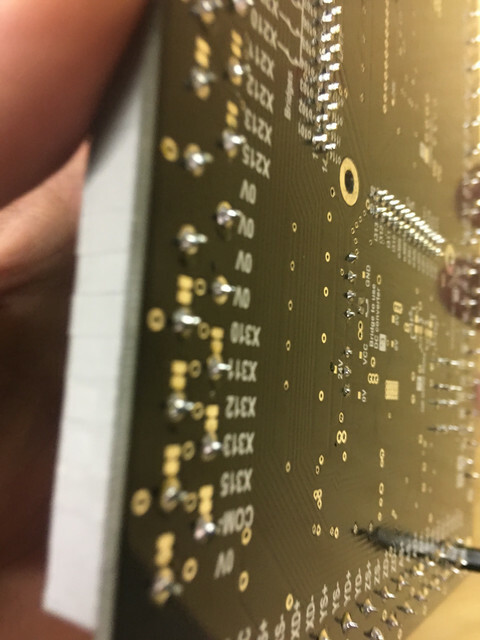 Power terminals with anti-torque stubs (or perhaps multiple attachment reflow solder legs) would definitely improve perception if not the quality of this aspect of the PCB design. It's not a cheap board anyway, so I'd be more than happy to pay that little extra for better quality anti-torque style terminals. I know Wurth has some nice products in this respect. I have no financial interest in Wurth, BTW. Wires ? Your not using Ferrules ? If not why not ? I'll second this – for the price of the board I was disappointed with both the terminals that were used. Additionally on my board I found all four of the terminal blocks were not correctly soldered while fully seated against the board. In other words, the blocks were able to rock back and forth since the bottom was not flat against the board. We're looking at using a different type of power and bed heater connector for future designs. Unfortunately it's hard to come up with a good solution that doesn't add £8-£10 to the retail cost of the board. Reliable PCB-mounting power connectors are not cheap, except for blade terminals and terminal blocks. If possible please can you email me (info@duet3d.com) with a picture of the terminal blocks from the side. I will highlight this to our manufacturers as it not acceptable. One point to make is that the terminal blocks for power in and the bed (while I agree they do need anti torque stubs) are rated to 35A. 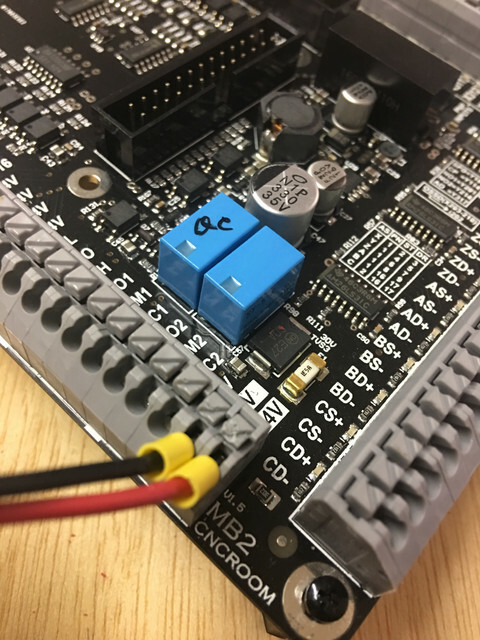 as David says power connectors above 20A that are reasonably priced and suited for automated manufacture are not particularly cheap. but guys spring loaded terminals are sweet…. just like old times..! some things just work..! Are the ring terminal power supply style connectors cheap? Those seem to be a good balance of keeping the wires in place while applying a good amount of pressure. The ring terminals are pretty easy to crimp as well. What exactly happens if you soldered to that connection? Does it generate uneven amounts of heat because of the current? All I know for sure is that it's not supposed to be done for that reason? Just to add to the conversation - since I don't see that I would be connecting/disconnecting the wires from these connections on a regular basis they seem adequate to me - I simply grasp the connector while tightening the screws and all is well. 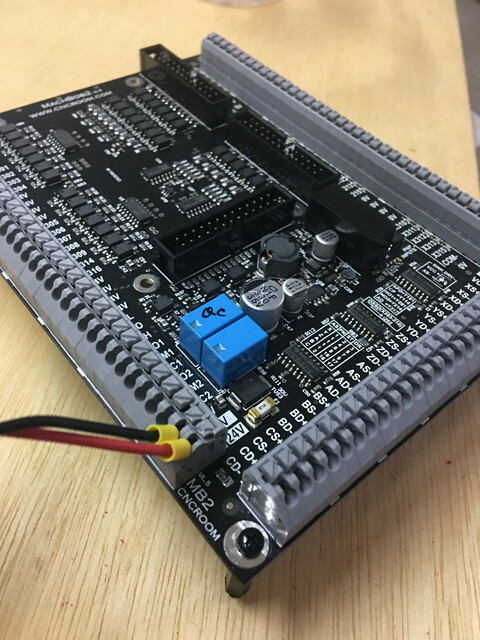 You should check out the wire connectors used on the MB2 breakout board, I use it on my CNC machine and it is a pleasure to work with. They are spring loaded… I also ended up with a situation where i put too large of ferrul in and needed to remove it. attempting to do so on the Duet would most likely snap the connector off but the MB2 was solid. For what it's worth I've used some name brand high current industrial power supplies that have the same issue when you really tighten the screws. What sort of connectors are you looking for? Wurth makes some 20A pluggable terminal blocks (Model 313 it looks like) that go for about $1 for the block/plug pair (2 pole). I've never used wurth (phoenix contact for me) but they don't seem like a bad deal. The Width ones you mention, 313 series, mate with connectors that are themselves screw terminals by the look of it. The issue there is you now double the potential failure points while still having the screw terminals. You do have the advantage of being able to plug and unplug the power connector however once installed this should be a rare event. I am not saying the screw terminals are perfect, just that I am not a fan of the screw terminal+plugs as a replacement. Like I said, we're looking at alternative connectors for the next generation - the current Duets don't have enough space for anything else. I already have some samples of lever-operated terminal blocks, and we are evaluating XT30 connectors too. We're also considering the same type of screw terminals that most PSUs have.